This paper presents data on temporal changes in snow and firn, which were not available before. 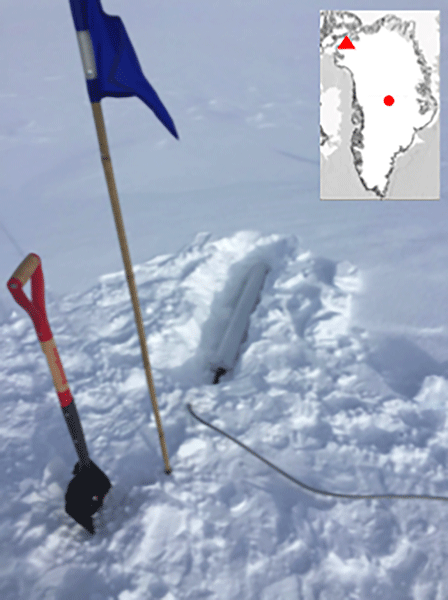 We present data on water infiltration in the percolation zone of the Greenland Ice Sheet that improve our understanding of liquid water retention in snow and firn and mass transfer. We compare those findings with model simulations. It appears that simulated accumulation in terms of SWE is fairly accurate, while modeling of the individual parameters density and liquid water content is incorrect. In this paper we analyze snow data from Soviet airborne expeditions, Sever, which operated in late winter 1959-1986, in the Arctic and made snow measurements on the ice around plane landing sites. The snow measurements were made on the multiyear ice in the central Arctic and on the first-year ice in the Eurasian seas in the areas for which snow characteristics are poorly described in the literature. The main goal of this study is to produce an improved data set of snow depth on the sea ice. An important factor for Earth's climate is the high sunlight reflectivity of snow. By melting, it reveals darker surfaces and sunlight is converted to heat. We investigate how well this process is represented in reanalyses data sets compared to observations over Russia. We found snow processes to be well represented, but reflectivity variability needs to be improved. Our results highlight the need for a better representation of this key climate change feedback process in modelled data. In this study, we used three independent methods (in situ measurements, comparison of digital elevation models and modelling) to reconstruct the mass change from 2000 to 2016 for three glaciers in the Tien Shan and Pamir. 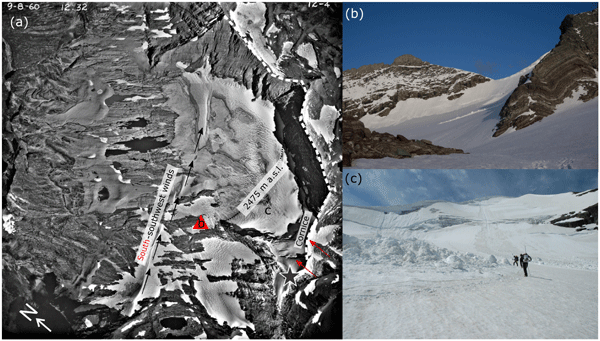 Snow lines observed on remote sensing images were used to improve conventional modelling by constraining a mass balance model. As a result, glacier mass changes for unmeasured years and glaciers can be better assessed. Substantial mass loss was confirmed for the three glaciers. Melt ponds occupy a large part of the Arctic sea ice in summer and strongly affect the radiative budget of the atmosphere–ice–ocean system. The melt pond reflectance is modeled in the framework of the radiative transfer theory and validated with field observations. It improves understanding of melting sea ice and enables better parameterization of the surface in Arctic atmospheric remote sensing (clouds, aerosols, trace gases) and re-evaluating Arctic climatic feedbacks at a new accuracy level. 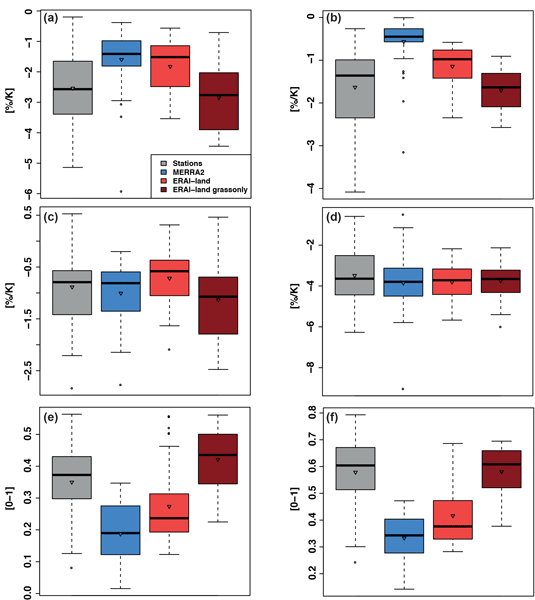 In this study, we investigated mercury dynamics in an interior arctic tundra at Toolik Field Station (200 km from the Arctic Ocean) during two full snow seasons. We continuously measured atmospheric, snow gas phase, and soil pores mercury concentrations. We observed consistent concentration declines from the atmosphere to snowpack to soils, indicating that soils are continuous sinks of mercury. We suggest that interior arctic snowpacks may be negligible sources of mercury. We investigate the relationship between ice wedge polygon topography and near-surface ground temperature using a combination of field work and numerical modeling. We analyze a year-long record of ground temperature across a low-centered polygon, then demonstrate that lower rims and deeper troughs promote warmer conditions in the ice wedge in winter. This finding implies that ice wedge cracking and growth, which are driven by cold conditions, can be impeded by rim erosion or trough subsidence. 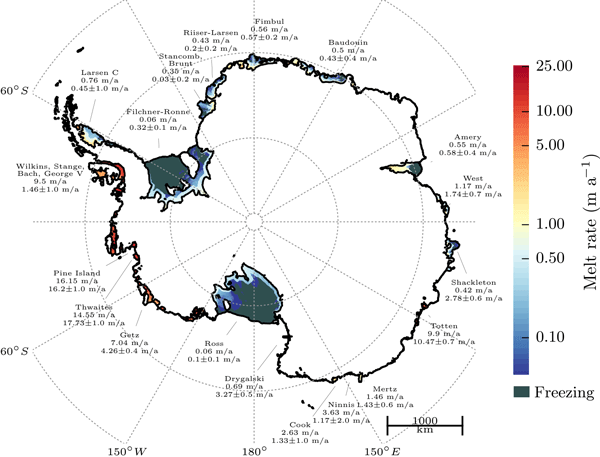 Floating ice shelves surround most of Antarctica and ocean-driven melting at their bases is a major reason for its current sea-level contribution. We developed a simple model based on a box model approach that captures the vertical ocean circulation generally present in ice-shelf cavities and allows simulating melt rates in accordance with physical processes beneath the ice. We test the model for all Antarctic ice shelves and find that melt rates and melt patterns agree well with observations. This work is the first to gain insight into the local surface mass balance over Antarctica using accurate long-term snowfall observations. A non-linear relationship between accumulation and snowfall is discovered, indicating that total surface mass balance measurements are not a good proxy for snowfall over Antarctica. Furthermore, the meteorological drivers causing changes in the local SMB are identified. 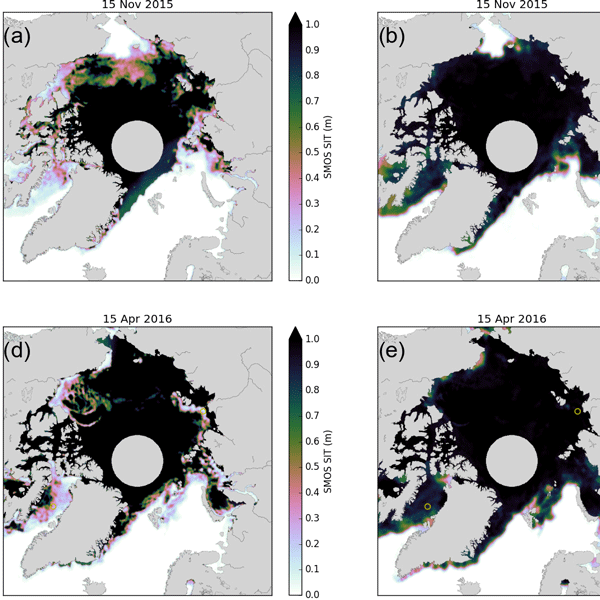 Medium-range predictability of early summer sea ice thickness in the East Siberian Sea was examined, based on TOPAZ4 forecast data. Statistical examination indicates that the estimate drops abruptly at 4 days, which is related to dynamical process controlled by synoptic-scale atmospheric fluctuations such as an Arctic cyclone. For longer lead times (> 4 days), the thermodynamic melting process takes over, which represents most of the remaining prediction. Ancient air enclosed in bubbles of the Antarctic ice sheet is a key source of information about the Earth's past climate. However, a range of physical processes in the snow layer atop an ice sheet may change the trapped air's chemical composition before it is occluded in the ice. We developed the first detailed 2-D computer simulation of these processes and found a new method to improve the reconstruction of past climate from air in ice cores bubbles. The calving line location of the Pine Island Glacier did not show any trend within the last 70 years until calving in 2015 led to unprecedented retreat. In February 2017 we accessed this previously ice-shelf-covered area with RV Polarstern and mapped the sea-floor topography for the first time. 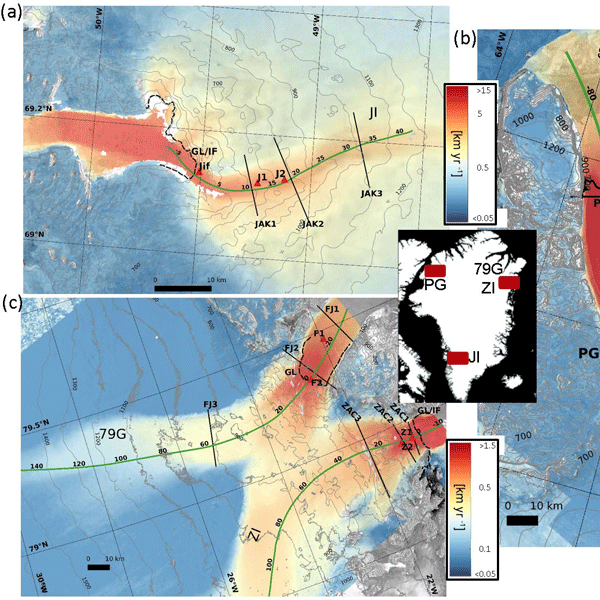 Satellite imagery of the last decades show how the newly mapped shoals affected the ice shelf development and highlights that sea-floor topography is an important factor in initiating calving events. We compare Arctic sea-ice thickness from L-band microwave satellite observations and an ocean–sea ice reanalysis. There is good agreement for some regions and times but systematic discrepancy in others. Errors in both the reanalysis and observational products contribute to these discrepancies. Thus, we recommend proceeding with caution when using these observations for model validation or data assimilation. At the same time we emphasise their unique value for improving sea-ice forecast models. 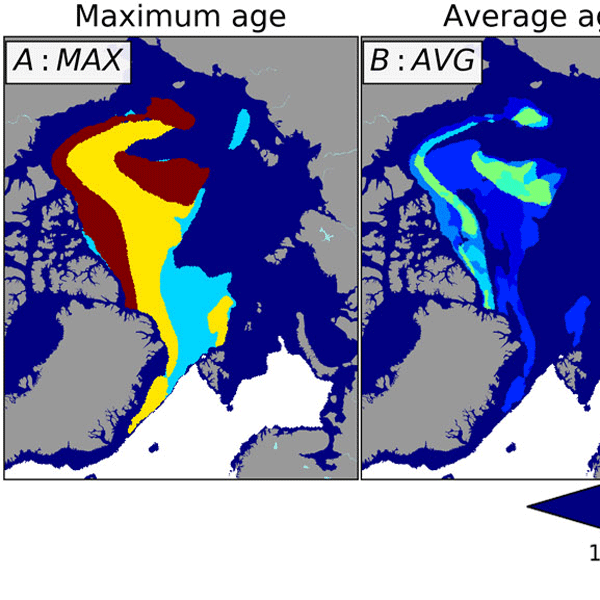 A new algorithm for estimating sea ice age in the Arctic is presented. The algorithm accounts for motion, deformation, melting and freezing of sea ice and uses daily sea ice drift and sea ice concentration products. The major advantage of the new algorithm is the ability to generate individual ice age fractions in each pixel or, in other words, to provide a frequency distribution of the ice age. 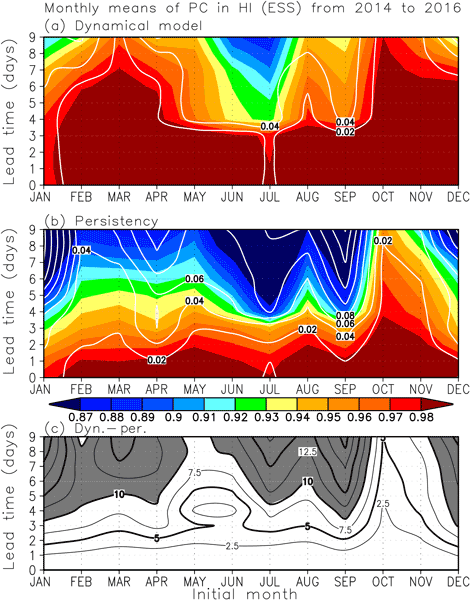 Multi-year ice concentration can be computed as a sum of all ice fractions older than 1 year. 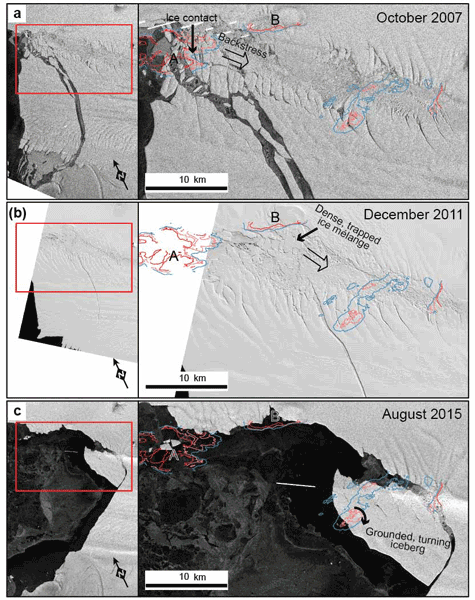 We present time-series of ice surface velocities on four key outlet glaciers in Greenland, derived from sequential satellite imagery acquired between October 2014 and February 2017. We demonstrate it is possible to resolve seasonal and inter-annual changes in outlet glacier with an estimated certainty of 10 %. 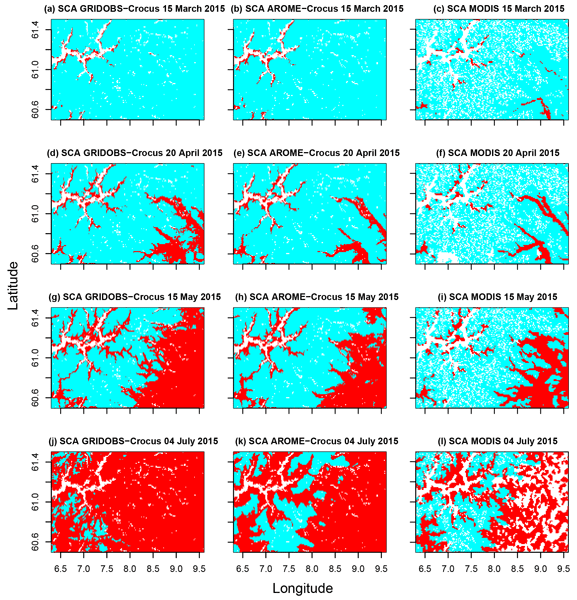 These datasets are key for the timely identification of emerging signals of dynamic imbalance and for understanding the processes driving ice velocity change. 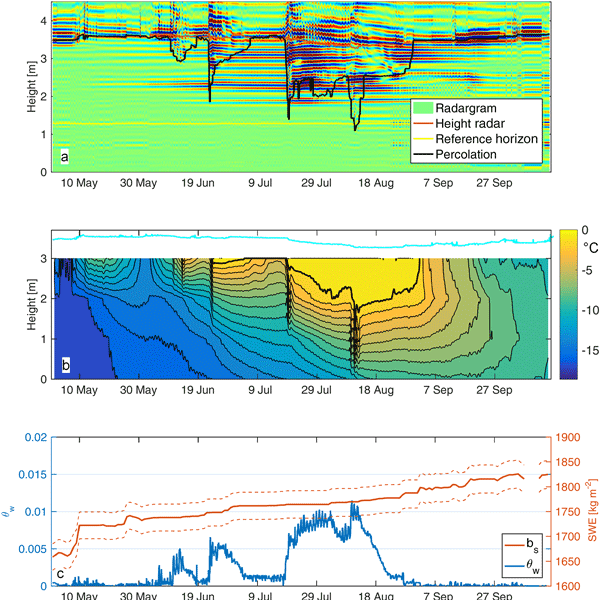 In this paper we present the first application of cosmic ray neutron sensing for continuously measuring in situ accumulation on an ice sheet. We validate these results with manual snow coring and snow stake measurements, showing that the cosmic ray observations are of similar if not better accuracy. 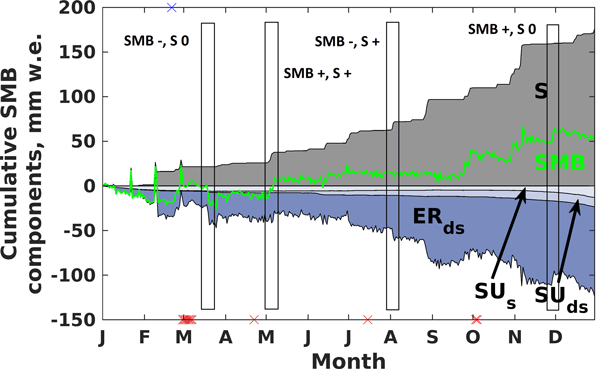 We also present our observations of variability in accumulation over 24 months at Summit Camp, Greenland. 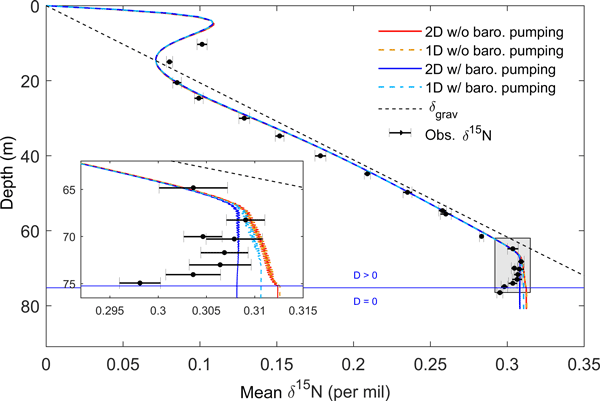 We conclude that cosmic ray sensing has a high potential for measuring surface mass balance. Knowledge of the snow reservoir is important for energy production and water resource management. In this study, a detailed snow model is run over southern Norway with two different sets of forcing data. The results show that forcing data consisting of post-processed data from a numerical weather model (observations assimilated into the raw weather predictions) are most promising for snow simulations when larger regions are evaluated. Snow algal bloom can substantially increase melt rates of the snow due to the effect of albedo reduction on the snow surface. 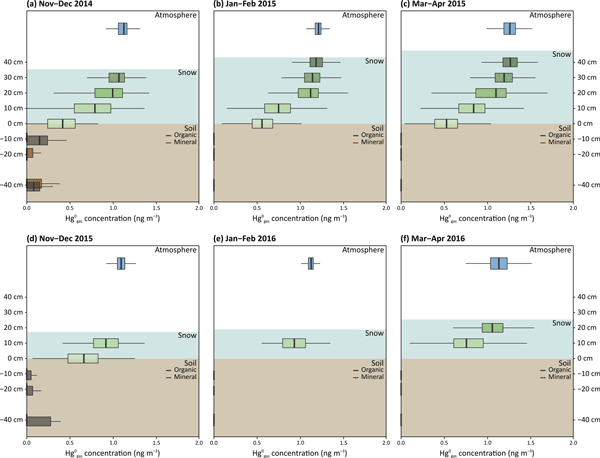 In this study, the temporal changes in algal abundance on the snowpacks of Greenland Glacier were studied in order to reproduce snow algal growth using a numerical model. 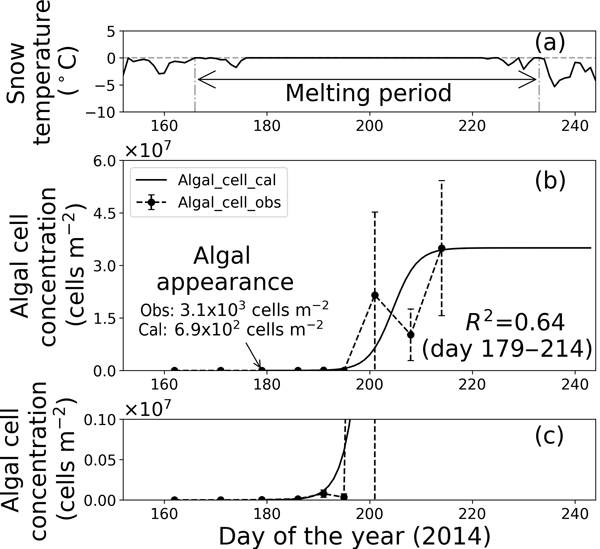 Our study demonstrates that a simple numerical model could simulate the temporal variation in snow algal abundance on the glacier throughout the summer season. 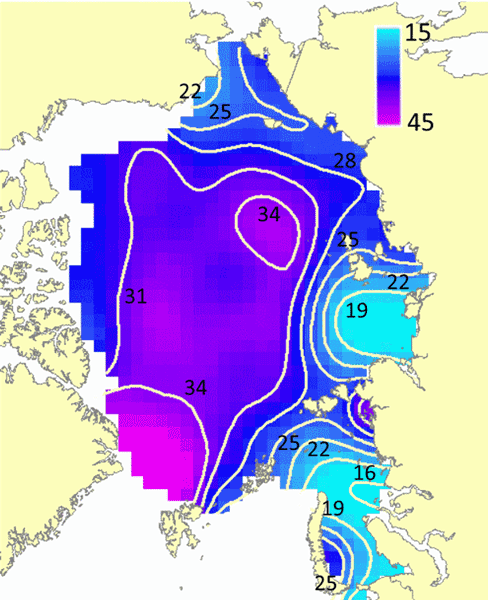 The balance of longwave and shortwave radiation plays a central role in the summer melt of Arctic sea ice. It is governed by clouds and surface albedo. The basic question is what causes more melting, sunny skies or cloudy skies. It depends on the albedo of the ice surface. For snow-covered or bare ice, sunny skies always result in less radiative heat input. In contrast, the open ocean always has, and melt ponds usually have, more radiative input under sunny skies than cloudy skies. Locating a suitable drill site is a key step in the Antarctic oldest-ice challenge. 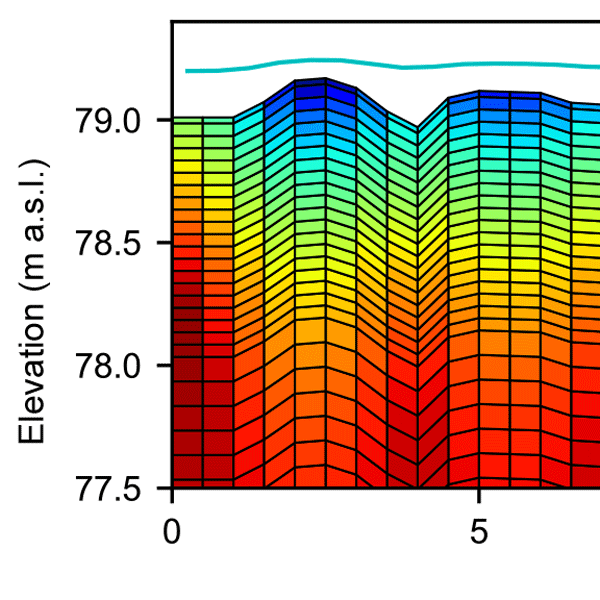 Here we have conducted a 3-D ice flow simulation in the region of Dome C using a refined bedrock description. 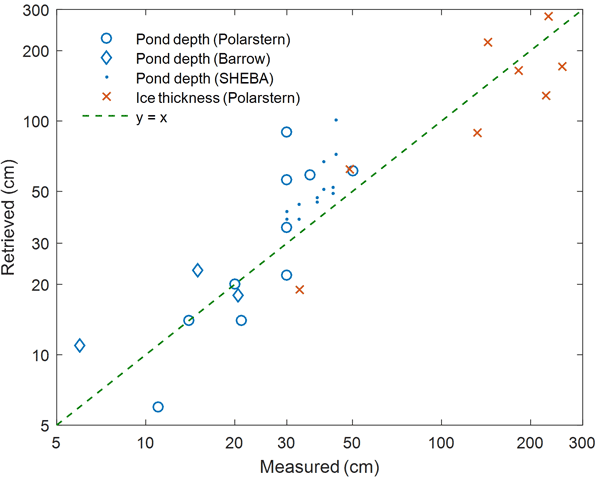 Five selection criteria are computed that together provide an objective overview on the local ice flow conditions. We delineate kilometer-scale favorable areas that overlap with the ones recently proposed by another group. 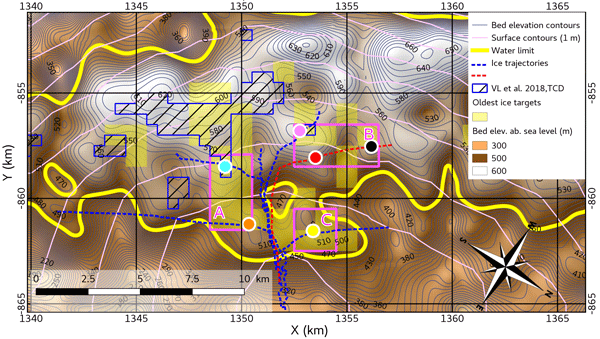 We propose a few drill sites that should be surveyed during the next field seasons.